Paine, in fact, is a regular fixture on Hollywood’s green social scene, often pulling up to premieres and parties in his show-stopping Tesla, but these days he’s just as likely to leave his electric sports car at the charging station while the party comes to him. In June, the director unveiled his latest work: a state-of-the-art, eco-chic event space in the 1957 post-and-beam house in Culver City that he also calls home. Named Marrakesh House for its riadlike central courtyard and shared latitude with the Moroccan city, the 4,300-square-foot residence is almost completely solar powered, and an organic garden overflows with herbs, heirloom lettuces, squash, watermelon and more. For the San Francisco native, the main intentions behind Marrakesh House were to foster a sense of community in L.A. and put the concepts of sustainable living and entertaining into practice, from the electric cars shuttling guests to the house to the organic mint in the mojitos (served in glass or compostable cups, of course). Paine worked with a team to bring his midcentury Moroccan vision to life, joining with sponsors like the local sustainable furniture company Cisco Homes and Toto, which provided low-flow toilets and automatic shut-off faucets. 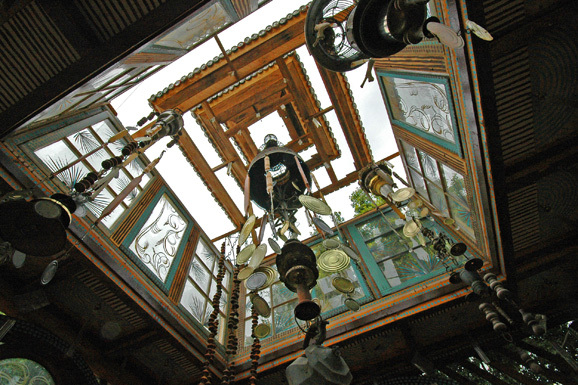 Interior designer Charlotte Jackson created the hand-painted, haremlike “Marrakesh Room,” and artist Shrine crafted the whimsical teahouse that looks over the salt-water pool, using fallen trees from the property, crystals from a chandelier that once hung in the house and bona fide L.A. trash. Slabs of Moroccan marble with embedded fossils comprise the unique kitchen counters. Richmond picked up her knowledge of global cuisine touring the world as Michael Jackson’s private chef, and the 500-ish guests at the grand-opening party nibbled Middle Eastern treats such as quinoa falafel, figs, artisanal cheeses and fresh olives while they listened to an acoustic set by Ben Lee. Later, belly dancers and fire-eaters performed with Naked Rhythm, a world electronica group led by house musical director Avi Sills, whose career took a quantum leap when he produced a “World Cirque” variety show for Sting’s birthday party. According to Sills, the acoustics of the courtyard, which is painted a deep French blue, are ideal for live music. Audio and video feeds in every room and movie screens behind the walls also make screenings and presentations a snap. “Chris had the whole house wired beautifully,” he says.